The Verde River Exchange aims to protect Verde River flows and promote sustainable economic development in the Verde Valley by providing a tool for addressing the unmanaged groundwater pumping that threatens to dry up stretches of the Verde River. The Verde River Exchange is an innovative and community-driven “water offset program” that allows groundwater users to offset the impact of their water use by purchasing credits. Credits are created when an existing water user voluntarily reduces their water use. Initiated and supported by Verde Valley businesses, local decision makers, residents, and conservation organizations, the Verde River Exchange’s balancing mechanism offers a path forward to help preserve the Verde Valley’s rural character and unique beauty while also meeting local water needs. Page Springs Cellars & Vineyards helped launch the Verde River Exchange as an inaugural participant in 2016 and renewed its participation again in 2017. This family-owned vineyard and winery overlooks pristine Oak Creek as it flows into the Verde River. Along with its delicious Rhône-style wines, Page Springs Cellars & Vineyards also offers gourmet food selections and breathtaking views. Caduceus Cellars and Merkin Vineyards helped launch the Verde River Exchange as an inaugural participant in 2016 and renewed its participation for a second year in 2017. A Verde Valley treasure, Caduceus Cellars & Merkin Vineyards features a tasting room and winery perched above Jerome, Arizona as well as the Merkin Vineyards Tasting Room & Osteria in downtown Cottonwood, Arizona. The Fish’s Garden joined the Verde River Exchange in 2017. This sustainability-minded business utilizes aquaponics, a low-water-use farming method that combines fish and vegetable farming in a single system. First started as a small family business in Camp Verde, Arizona, the Fish’s Garden is now a 3,000-square-foot commercial greenhouse that sells produce to local Verde Valley restaurants. Out of Africa Wildlife Park, located in Camp Verde, Arizona, provides an opportunity to see hundreds of wild-by-nature animals from all over the world. As one of the Verde Valley’s largest employers and most visible private businesses, Out of Africa’s decision to offset water use through the Verde River Exchange in 2017 provides a highly visible example of water stewardship. 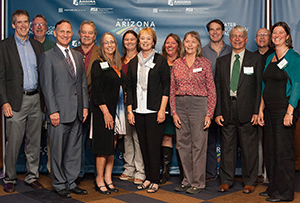 Verde River Exchange advisory council members and others gather at the 2016 Arizona Water Innovation Challenge awards ceremony, where the Verde River Exchange was one of five statewide finalists.